Wow, I can't believe we've hit the half year mark! ​Eating has still been a ton of fun! Jacob absolutely loves eating anything and everything we put in front of him-so I'm going to enjoy it while it lasts! His current favorite foods are still peas, bananas, and apples, but he has loved some of the combinations of foods we've made for him lately like blueberry/banana and carrot/apple. He is eating solid food at least twice a day and is down to nursing just in the morning. My supply tanked this month when Jacob went on a nursing strike New Year's Eve. Yeah, not fun and not what I had in mind, but he is taking formula like a champ and had a great six months of nursing! Ugh, if it's not one thing it's the other! 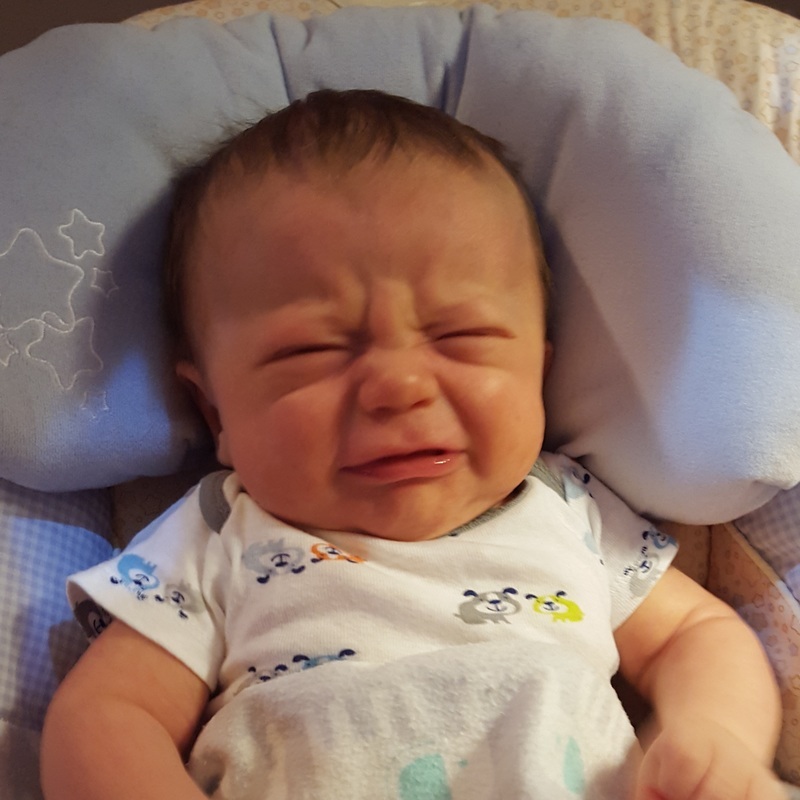 Just when he started sleeping through the night, the nursing strike and teething started. Our perfect sleeper is now waking up 3/4 times a night again...but has started taking naps at home! It's frustrating when you think you have a routine down and then everything changes overnight. However, we are going to go back to the Ferber method and hope that he will be sleeping better soon. Christmas was so much fun with him this year! He has started sitting up on his own and loves playing with his toys this way. 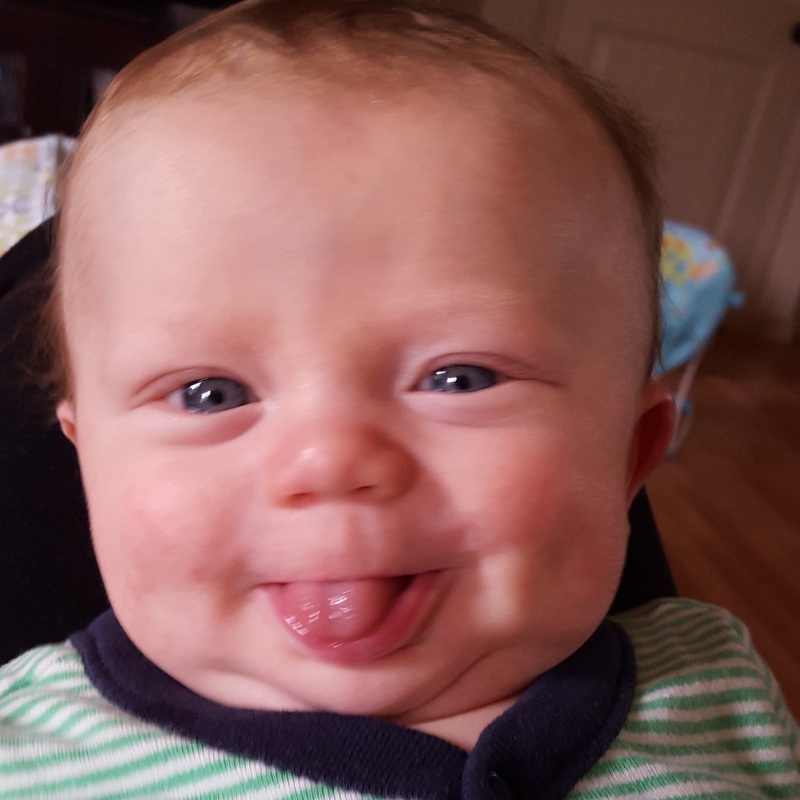 He constantly giggles and laughs, we discovered he is ticklish, and he has learned to "fake cough" to get our attention. It is an absolute joy seeing him develop! He still refuses to roll over all the way from back to belly, but I think it's because he hates being on his stomach still. He definitely has the physical ability to do it, but just refuses. Everything will come in time. He continues to be the best baby ever...what more can I say? ​Eating has been so much fun this month! 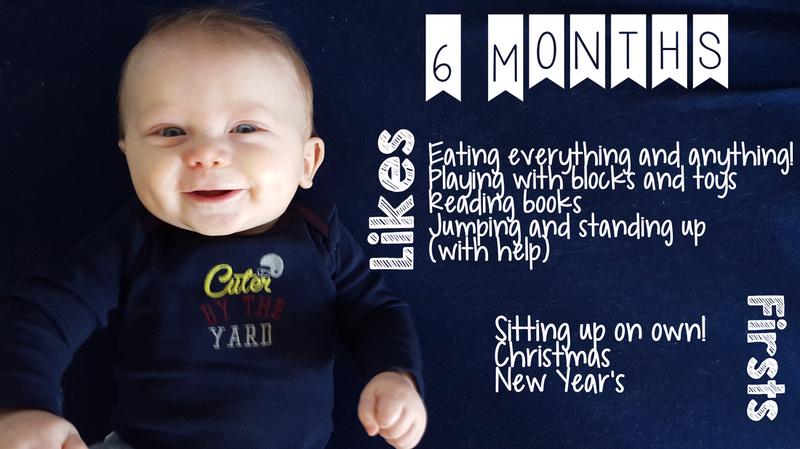 We started solid foods, with Jacob eating at least one meal a day (but usually two). We started with carrots, which he liked, and then moved onto squash, sweet potatoes, bananas, apples, pears, peas, and peaches. We thought he didn't like the pears at first, but it was just a fluke because he gobbled them up the other day! We are making homemade baby food purees, and my husband has loved whipping up creations for Jacob every week. Our amazing pediatrician advised us to skip the rice cereals and oatmeal as they aren't as tasty and lack the nutritional value that real vegetables and fruits have. Gosh, we just love her. She's the best ever...but I digress! Jacob is still taking three bottles a day at the sitter and they are still about 4-5 ounces each. It's been harder keeping up supply wise, but nursing is still going strong. Hallelujah-we are sleeping through the night! Jacob has been consistently sleeping through the night for the past month. 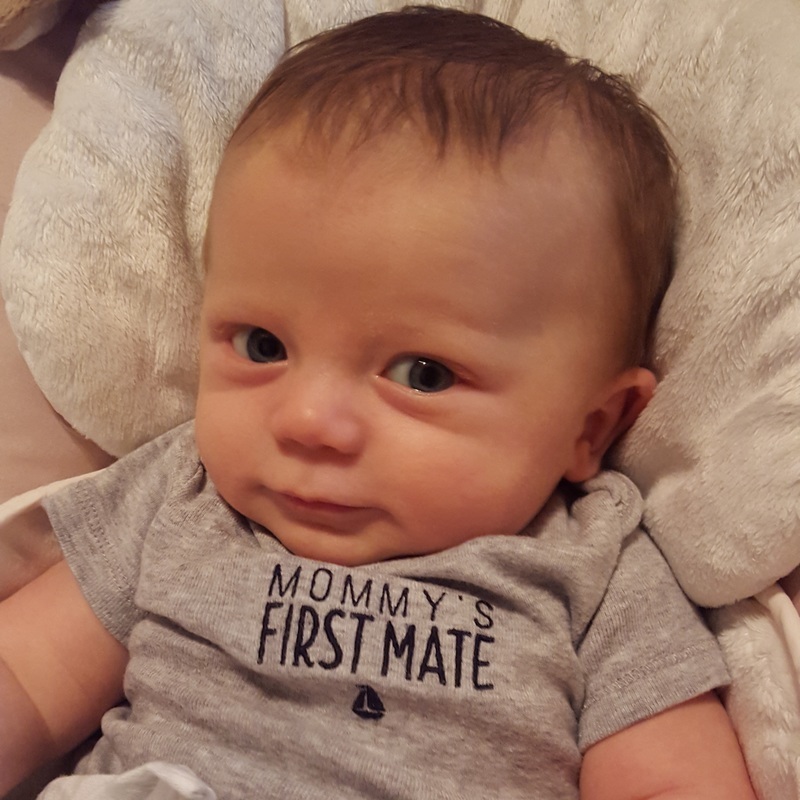 We used the Ferber method, so the first night was a little tough, but he has learned how to settle himself and is so routined now that he will roll over and go to sleep as soon as we lay him in his crib. 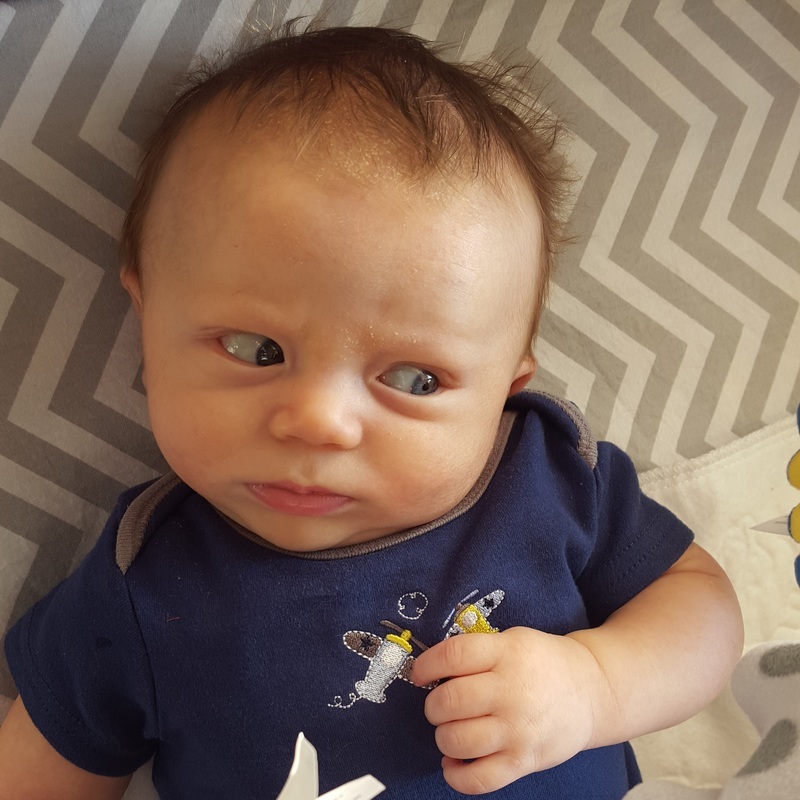 Let me tell you, when our pediatrician told us that he was plenty old enough to sleep through the night I didn't fully believe her, but now that he is sleeping through the night there is no going back! We start his bedtime routine around 6:45 with bath, nursing, and books, and then cuddle a bit before bedtime. It has been amazing! Naps, on the other hand, are still a struggle at home (not at the sitter). We will probably need to get in a better routine for naps as well, as during weekends Jake has a different schedule with us running errands, sleeping in the car, etc. Jacob continues to amaze us every day. He loves to stand up and see what's going on. He can sit up for a few seconds on his own, but still topples over. He "talks" all the time and loves to blow raspberries at us. 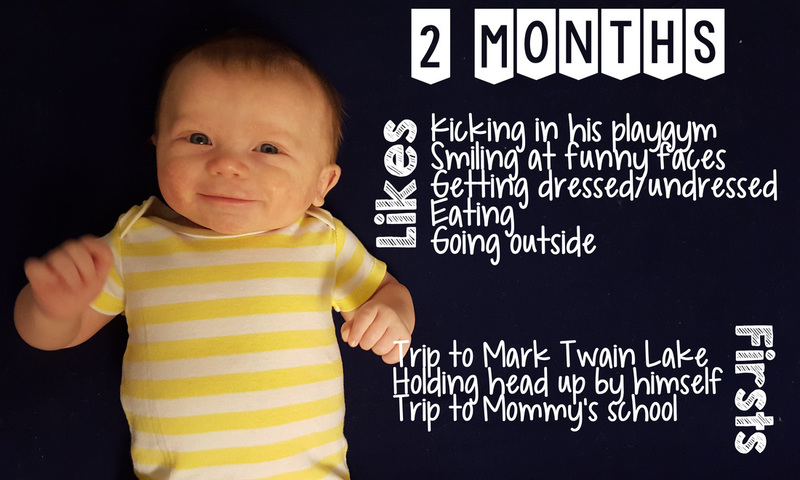 He has really discovered his giggle as well, and loves to laugh when we kiss him and play with his tummy. 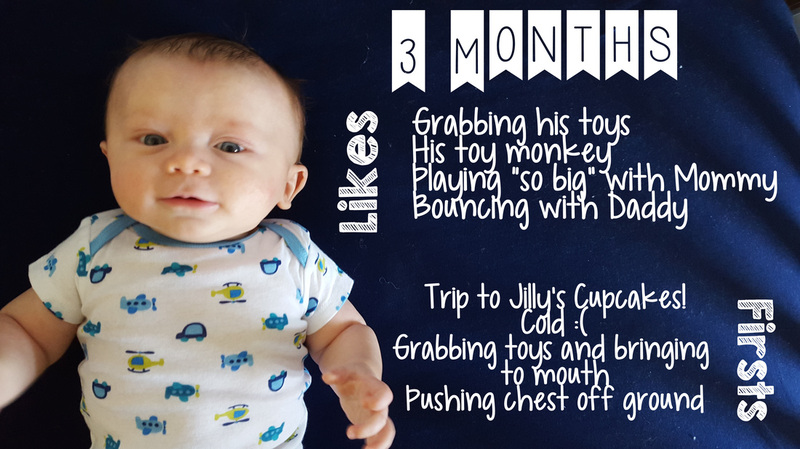 He is also obsessed with grabbing faces and "kissing" us, which is beyond adorable! This month he met Santa for the first time and had his first Thanksgiving, where he happily gobbled down sweet potatoes. I can't wait for Christmas with him! Man, I love this kid! 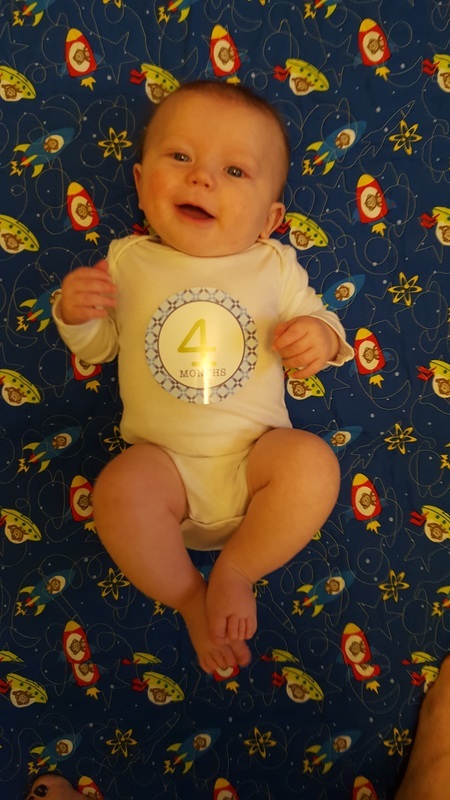 I cannot believe he is four months already! Eating has been going great! He still takes three bottles at the sitter (usually around 5 ounces each) and nurses once in the morning and twice in the evening. He is such a great eater! We got the okay to start baby food from our pediatrician and my husband cannot WAIT to start making baby food! I couldn't ask for a better eater...and his chunky rolls prove it! Well, sleeping has been the biggest struggle this month. I would nurse Jacob around 7:30 and he would fall asleep, and as soon as we would put him in the crib, he'd scream. Then he would wake up pretty much every hour and would scream until I would nurse him back to sleep. It was MISERABLE. 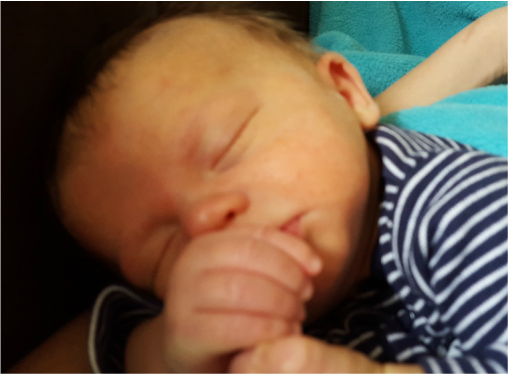 After talking to our doctor (who I'm convinced is a wizard), we discovered that Jacob was starting to develop a habit that he thought he needed to be held/rocked/nurse in order to go to sleep, even though he is perfectly capable to self-soothing and settling himself and is NOT hungry. She suggested the Ferber method, and even though it was hard to hear him cry the first night, things are going SO much better and he is finally sleeping. I can even tell he is getting better sleep because he is waking up happy and giggling! Hallelujah! Jacob has a great little personality! He loves playing peek-a-boo and going outside. He is loving his exersaucer and prefers to stand up. He started rolling over this week too! I have never been so excited in my life! He has really become a little person in the past month...I can't believe it. We had our first holiday this month-Halloween! Jacob was by far the cutest little Tigger ever. We even walked to a few houses together to get some candy for Mommy and Daddy. :) Jacob got his first ear infection this month...it was horrible! He also developed a rash after taking the amoxicillin and I panicked that he was having an allergic reaction. It turned out he only was having a bout of baby eczema, so he uses some hydro cortisone cream now to help his little skin. Now he is back to being his happy little self. Weight: at his four month appoinment he was 15.9 pounds! I love my little chunker! 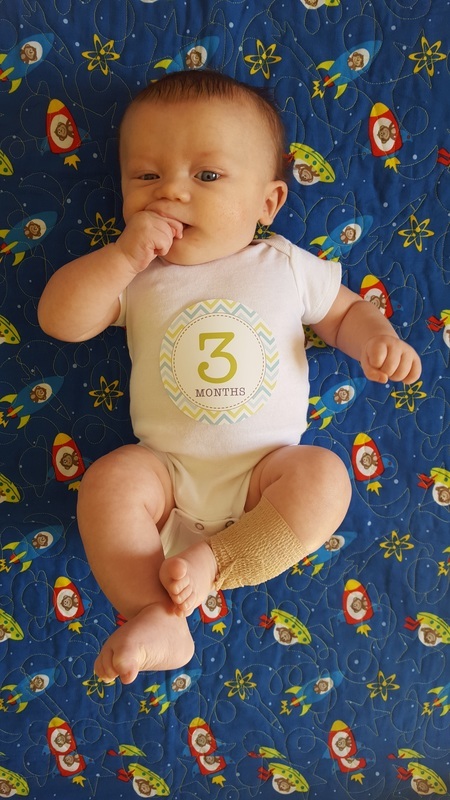 Clothes: All 6 month clothes, and some of the pajamas are getting a little tight on his feet! Can someone please make time stop? Man, this kid likes to eat! He is nursing every day in the morning, taking three bottles at the sitter, and then nursing around twice a night. He still wakes up to eat once or twice an evening as well. It's amazing how much faster he is getting at nursing-he used to eat for such a long time and now he is much better at getting his food fast! The medication for his reflux has really helped...he seems very comfortable and hardly ever spits up. I'm excited to start rice cereal in a month! Well, I wish I could say that we are both sleeping through the night, but we just aren't quite there yet. Most nights Jacob goes to bed around 8:00-8:15. We give him a bath every other night and rock him starting around 7:30. He usually falls asleep nursing, but we have been getting better at putting him to bed while he is awake. We stopped swaddling him a few days ago, and will transition him out of the rock and play while I am on Fall Break next week! He is getting so big! He is always so happy when he wakes up too and will talk and babble until we go in his room. He greets us with the biggest, happiest grin! We still aren't rolling over all the way just yet, but he rolls to his sides and has discovered his hands! He will open and close them and is now reaching for toys (he even has favorite toys now) and putting them in his mouth! He pushes down when he is standing up and can hold up his head much better. It's amazing how much he has changed in such a short amount of time! Weight: around 14/15 pounds now! Oh...here goes nothing people. Life has changed completely since I've been back to work! 2:30 AM- Jake is up and hungry. I nurse him for a half hour or so and try not to fall asleep in his rocker. 5:00 AM- My alarm goes off. I stumble out of bed and straighten my hair and do my makeup. I don't get dressed yet, as I learned the hard way that there are still many opportunities for Jake to pee/spit up/etc. on me before it's time to head to work. 5:15 AM- Jake is stirring. I try and hold off going in there until closer to 5:45. Fingers crossed he settles himself. 5:16 AM- I head downstairs and start the coffee. I heat up water in the electric kettle for my oatmeal, and make myself a bowl of oatmeal with fresh bananas. 5:35 AM- Jacob is still stirring. I take a few bites of my oatmeal, pour myself a cup of coffee with my new pumpkin spice creamer, and head upstairs to wake up my little buddy. 5:45 AM- I give Jacob his reflux medicine while he is elevated in his rock and play and in a great mood. We talk and giggle and snuggle in his rocker and get dressed for the day and change his diaper. 6:00 AM- Jake and I head downstairs. I finish my oatmeal and coffee while he plays on his activity gym or in his bouncer. 6:10 AM- I nurse Jake while dreading the idea of leaving him for the day...again. I respond to emails on my phone and check Pinterest. 6:30 AM- I bring Jake upstairs to Daddy while I finish getting ready. They snuggle in bed and talk and play while I load up my pump, teacher bag, his bag, the rock and play, and his bottles for the day in the car. I also prep my Tervis tumbler of water and tumbler of coffee. I almost forget to pack my lunch for the day but remember just in time! 7:05 AM- Daddy brings Jake downstairs and loads him in his carseat. I get in the car and start my pump. I pump while driving to the sitter and talk to my best friend through bluetooth to help the drive go easier. 7:35- We arrive at the sitter. I let her know about how awesome Jake has been sleeping and kiss him goodbye. 7:40- I get back in the car and pump on my way to work. 8:05- I arrive at school. I frantically make copies for the day and get as many things ready as I can. I put all my milk that I pumped in my fridge (I'm trying to freeze at least two bottles and pump three bottles a day) and eat a pumpkin muffin to keep from falling asleep at my desk. 8:50- The kids start filing in. We have class meeting, math, and word work in the morning. 11:25- Lunchtime! I pump in my classroom and scarf down my food while grading the math papers from the morning. 12:05- I pick the kids up from recess. We have read aloud and guided reading time. I meet with a group about one of my favorite books Because of Mr. Terupt. 1:00- Time to go to specials. I pump (again) in my room and update my classroom website. I respond to parent emails, plan some activities for tomorrow's class meeting, and try and stay on top of the mountain of paperwork I have to complete. 2:00- The kids are back from specials and we have snack. We have reading and writing units of study in the afternoon. 4:00- We start packing and stacking. We are all anxious to leave for the day-afternoons are tough on both fifth graders and teachers! 4:15- The kids have left. I pack all my milk and teacher goodies in my bags, even though I know I probably won't get to any teacher paperwork tonight. 4:30- I get in the car and pump on my way to pick up my favorite fella! 5:00- I arrive at our sitter's house (it takes FOREVER to get there with afternoon traffic). I snuggle Jake and load him in the car for the ride home! 5:30- We are home and Jake is hungry. I hand him off to my husband while I clean his bottles from the day and load his bottles for tomorrow in the fridge. I also prep the coffee pot for the next morning! 5:45- Jake can't wait anymore, so my husband hands him off to me. I nurse him while my husband figures out dinner. 6:15- Jake is done nursing. We play and snuggle and play some more until he is cranky. We also eat dinner. 7:30- We are finished with bath and swaddled up for the night. I nurse him again on the couch while watching Top Chef with my husband. ​8:05- Jake is asleep and we head upstairs to put him down for the night. 8:15- I jump in the shower. I have been showering at night to give myself more time in the mornings. After my shower I head downstairs and have a glass of wine. I fall asleep while watching Top Chef...my new routine every night. 8:45- I head up to bed, ready to do it all over again tomorrow! I used to be one of those teachers who showed up to school two hours early and stayed late. The kind of teacher who spent hours on Pinterest creating new things for their classroom. The teacher who had an online classroom and checked in with their students nonstop during off hours. Well, I still think I'm a good teacher, but I'm not that teacher anymore. Having a baby really does change everything. I no longer have the luxury of having countless hours to spend on school. My time home is now spent soaking up every last snuggle with my little one, washing and packing things for the next day, or trying my best to get some sleep. I remember other experienced teachers telling me that my super-driven personality would adjust when I had a child one day. I also remember thinking, "HA! Those teachers don't know who they're talking to! I'll have just as much time when I have kids!" Boy, was I incorrect. I've really been struggling with this situation lately. It's really difficult for me to not feel like I'm not on my teaching game as much as I used to be. 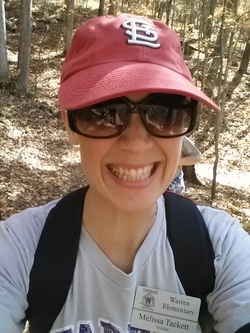 Sure, I am still making it to school early enough to make my copies and plan activities for my kiddos, but with pumping during lunch and on my plan, wanting to get to our sitters right away after school, and being sleep deprived, there are certainly days that focusing on school takes everything out of me. Then, I started to think about all of the ways that becoming a mom has made me a better teacher. Now when I look at my students I think about how they are someone's whole world, much like Jacob is mine. When I receive a parent email, I think about how I'll be that parent concerned about my kid someday. Being a parent has given me fresh, sleep-deprived eyes as a teacher, and even though I may feel like I'm not on my A-game 24/7, I can definitely say that I am a more caring teacher now that I'm a mom. I think it's important to forgive yourself as a new working parent. It's okay that my copies aren't made in advance for the entire week. It's okay if that math assignment doesn't get graded the night it's completed. It's okay to not take on 5,000 new things in the classroom simply because you know you won't remember to keep up with them when you are teaching on 4 hours of sleep. It's okay. I'm okay. I have a new paradigm...and that's okay too. 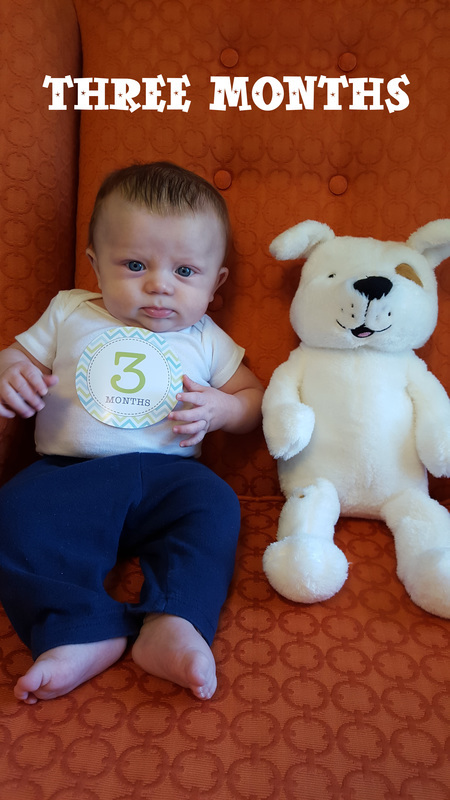 How has it been two months already?! This baby sure loves to eat! Right now Jacob is eating about 8-9 times a day. We had to get on a new schedule with me going back to work, which was difficult for both he and I. I usually nurse him around 2:00/3:00 in the morning and sometimes he wants to eat again at 5:00 AM...even though our "schedule" is for him to nurse again at 6:00 AM. There were a few mornings where he was just so darn sleepy and not used to me waking him up that he didn't want to eat at 6:00! Luckily, our sitter has done a great job keeping him on a schedule, and he takes three bottles during the day and nurses another 3 times or so at night when we get home. He definitely likes that bonding time we have together, and I'm starting to notice him getting excited to eat at night with me! My husband and I both noticed he even makes squeals and noises now when it's time to eat, which is pretty cute. He also has taken two COLD milk bottles now due to his impatience and chugged them down like a champ. I'm so relieved that his reflux hasn't affected his eating habits at all! Jacob has slept through the night a few times, but it still isn't consistent. He pretty much wakes up around 2:00/3:00 every morning. If we give him a bottle before bedtime, he sleeps much later! Jacob is still such a little ham. He smiles all the time and always, always smiles when we go in to wake him up in the morning. 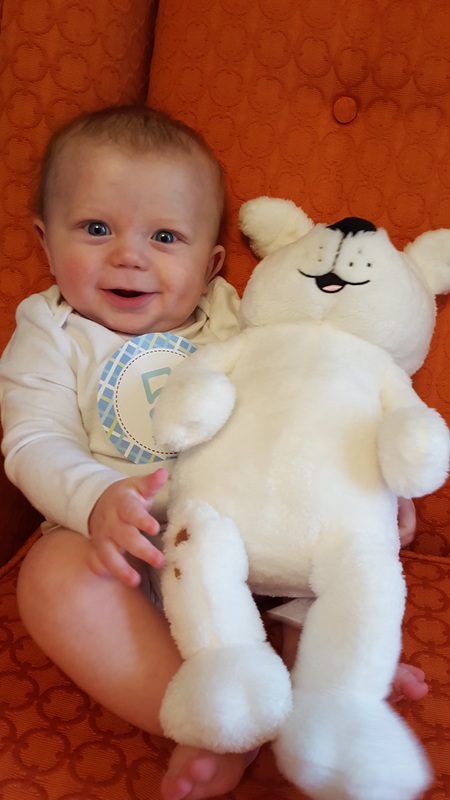 We can tell his reflux medicines have really kicked in because he seems much happier and comfortable (which is a huge relief for us). He loves to play in his playgym, make faces, and TALK! I know it's early to say, but this boy may be an early talker with how often he babbles already! 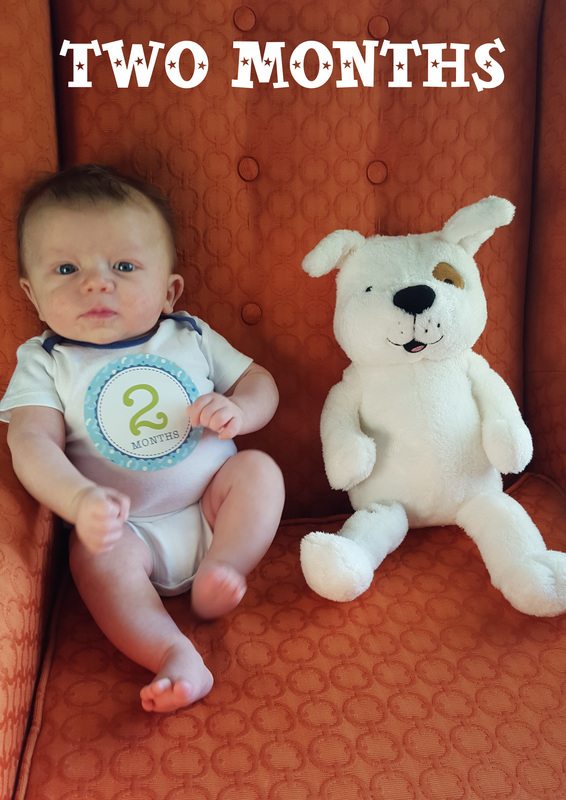 This month Jacob went on his first of many trips to Mark Twain Lake with his best buddy Oliver! My husband and I were so relieved that he did so well on his first "big trip!" 2:30 AM- Jacob is awake and ready to eat. I grab my cell phone, put on my glasses, and head to his room to feed him. I change his diaper and nurse him for about forty minutes, burping him in between. I check the news and Buzzfeed on my phone to keep me awake. 7:00 AM- ...And I'm right. Jacob is fussing. 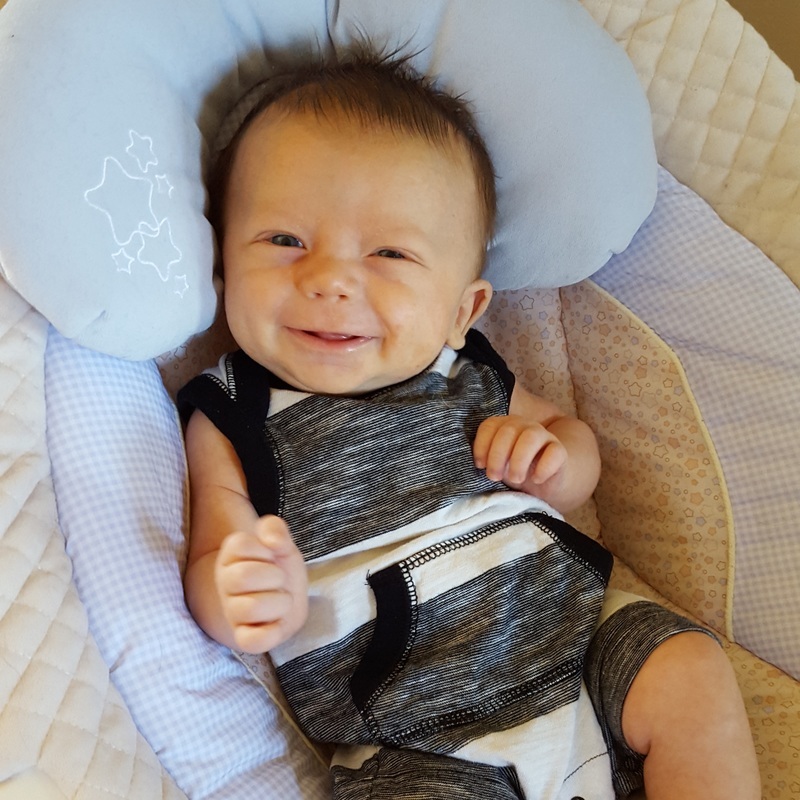 I head into his room and he greets me with a huge smile as I change his diaper again. He loves the morning! 7:10 AM- I head downstairs with Jacob as Lucy stays on my heels wanting to be fed. I lay him down on his play mat so I can start the coffee pot and feed Lucy. I make some coffee and oatmeal for myself with fresh bananas and blueberries (breastfeeding makes me so hungry). As I take my first bite Jake gets fussy and demands his breakfast. 8:15 AM- Daddy comes downstairs and snuggles Jacob for a while before leaving for work. He takes Lucy outside and helps unload the dishwasher before leaving for the day. 8:20 AM- Jacob and I play on the play mat for a while and have some tummy time. Project Runway plays in the background and I joke to Jacob that we need to "make it work" with his clothing choices today. 9:00 AM- We take our first nap of the day...or at least I attempt to. I try to give Jacob a pacifier for the hundredth time but he won't keep it in his mouth. He falls asleep on me as I watch another episode of Project Runway. 9:15 AM- Jacob wakes up for some odd reason and screams for five minutes until falling back asleep as I walk him around the house. 9:23 AM- I sit back down and breathe a sigh of relief that he is still asleep. 9:24 AM- I stopped moving, so Jake wakes up and now wants to play. I refuse to give in and rock him back to sleep and put him in his rock and play. 9:30 AM- I run a load of clothes in the laundry, clean upstairs, and check my work email. I pump and freeze half of what I pump for when I return to work, and leave the rest in the fridge for a bottle for later tonight. 10:45 AM- Jacob is awake and hungry. I nurse him and answer a parent email on my phone. 11:30 AM- I put Jake in the bouncer while I shower. He is fine playing with his toys until I wash my hair, then starts screaming until I am out and holding him (with a towel on my head and still undressed). I scramble to get ready while holding a fussy little guy. 11:45 AM- I attempt to make myself lunch while Jacob has tummy time on the play mat. He isn't having it. It's like he KNOWS every time I try to eat something! 11:50 AM- I play with Jacob for a while until he is fine on his own. I make myself a sandwich, grapes, and some yogurt with granola. I guzzle down as much water as I can. 12:15 PM- Jacob falls asleep in his swing and takes a nap while I finish eating and enroll in my health benefits online for this year. 12:55 PM- Jacob wakes up and nurses. 1:45 PM- We head to Target to pick up a few things on our shopping list. Jacob takes a nap in his carseat in the shopping cart. I put tons of cute baby clothes in the cart and then take them back out. I tell myself to wait until fall/winter before buying any of the cute wintery little boy clothes. 2:25 PM- I head to the pharmacy to pick up Jacob's reflux prescription. 3:15 PM- We are home and ready to play. We talk, sing, and read together until he is hungry. 5:30 PM- Daddy is home! He snuggles Jacob while I grab the laundry from earlier to put away. We make dinner and talk about our day and I nurse Jacob again. 6:45 PM- We eat dinner and play. We start our new nightly routine of putting "Top Chef" on while we wind down our day. 7:00 PM- I nurse Jacob (cluster feeding is oh so fun) while Daddy gets his bath ready. 7:30 PM- We give Jake his bath and get him in comfy clothes for bedtime. He plays a little bit and we snuggle him. 8:30 PM- I nurse Jacob and swaddle him downstairs. As he starts to get sleepy, I take him upstairs to his rock and play and he is down for the night. I head downstairs to watch Top Chef as my husband pours a glass of wine for both of us. 8:45 PM- Jacob is stirring, so my husband goes up to settle him while I enjoy my glass of wine. 9:00 PM- I fall asleep on the couch. 9:45 PM- My husband wakes me up to go upstairs. 11:30 PM- I wake up and go in to Jake's room. I head in there in the hopes he will sleep longer through the night if I try and feed him now. 4:00 AM- The late night feeding worked and a new day has begun! Let's Chat About Something Awkward Shall We? Let's have a little discussion about breastfeeding people. And let's be real about it. Let me start by saying that I had this image in my head of breastfeeding before Jacob was born. It would be these magical moments between him and I. He would be calm and serene. I would look like the true image of a mother, holding my sweet baby as he happily ate until he was full, and would then sleep for a few hours before it was time to nurse again. As I said in his one month update, Jacob and I never really had any skin to skin time after my C-Section. He was pretty bruised, I was still getting stitched back together, and I was downright exhausted after over 24 hours of labor. We let him go to the nursery and have formula that first night so I could get some much needed rest. The next day, we decided to get to business with the whole breastfeeding thing. My poor husband was awesome with helping, but we both didn't know what we were doing. Plus, we had no idea how much milk he was getting, and he seemed so upset even after eating that we knew he was still hungry. The nurses continued to be called in (every 2 hours by me) to help, but I never really learned any new positions to nurse. We were all very frustrated. Then, a few days later, we learned Jacob had jaundice. Our doctor told us it was very important that he nursed as much as possible. When she said that, I burst into tears. The thought of nursing even more than the 12 times a day I was currently doing made me feel so defeated. It was at that moment I decided to start pumping and supplemented with formula. If my milk wasn't fully "in," I wasn't going to let my baby suffer and not get enough to eat when he needed to. I felt like a warrior, saying, "Screw those lactation ladies! My baby needs to eat and I will let him!" 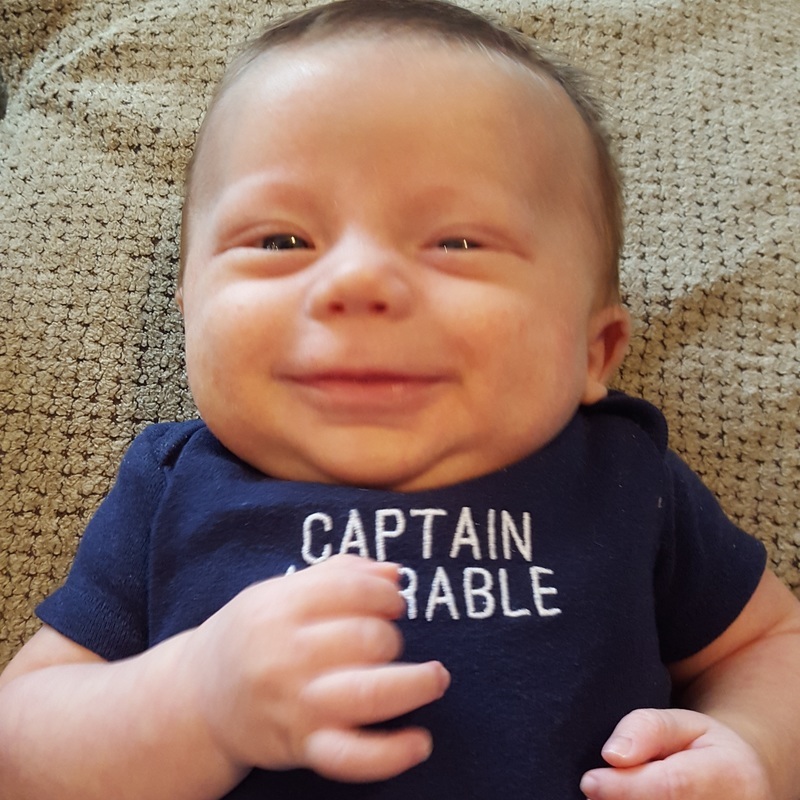 When we gave him the first bottle of formula, he was so...happy. And satisfied. Naturally, I lost it. I had another meltdown. Why couldn't I make my baby feel that way? He never seemed like anything other than angry when I nursed him, and now he was perfectly content. Still, I was determined to try and nurse, and I started giving him bottles of my expressed milk mixed with formula that evening. 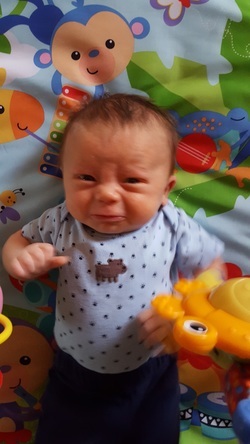 I was pumping upwards of 10 times a day, and we weren't even attempting nursing at this point anymore because I was so worried that he was eating enough with the jaundice.